PRODUCT: 13 inch Tile Roof Flashing Skirt. Fits Natural Light Solar Lights and Fans, 32 in. x 35 inch skirt 'SAF' Fan Models and 13 inch Solar Lights. Soft Heavy-Gauge Aluminum with a Rubber Seal. Fits over the base unit. Price/Each. (UPS shipping only). * OVERVIEW: The Natural Light Energy Systems #13S, Tile Roof Flashing Skirt, fits over the 13" SAF solar fan base and on the Natural Light # 13K series Solar Light. 1. 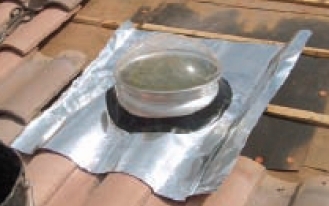 On the roof, locate a hole location and carefully remove surrounding tiles. Remove enough tiles to accommodate the skirt. Place flashing over the location where the unit will be installed and mark the flashing footprint onto the furring strips. Remove the portion of the furring strips where the inside of the flashing will be installed (allowing the flashing to sit directly on roof sheathing). 2. Outline the diameter of the hole that the base unit will pass through. NOTE: DO NOT CUT THROUGH ANY FRAMING MEMBER. 3. Caulk underside of fan base with the provided caulking material. Two concentric rings of caulking material is sufficient. Secure fan base with the Phillips head screws provided. Apply addition felt or roofing underlayment and furring strips as needed. 4. Install the flashing skirt over the fan base and press down the rubber ring all around the installed fan base. 5. On the high side of the roof towards the ridge, replace the tiles OVER the skirt. Cut tiles to fit around flashing . Adhere cut tiles using NP1 sealant. Some furring strips may need to be replaced on top of flashing footprint to support tiles. Replace the tiles on the low side of the roof. Slide under tile skirt and then reshape the skirt to form around the tiles. Again, adhere any cut tiles using NP1 sealant.